"We have had the most incredible experience with Dr. George. She is kind, thorough, open, honest and calming. We have seen so many doctors and because of how she handled us, it was easy to trust her. In the middle of an attack for my 3-year-old, she got us right in and made all the right calls, followed up, and answered every last question I had. We have been so impressed and I wouldn't want my gal in anyone else's hands with her asthma. Dr. George and nurse Brenda are phenomenal!" When harmless substances become invaders. Our immune system protects us from foreign organisms that could cause illness. In the case of allergies, our body mistakes harmless substances, such as pollen, as invaders. We call these substances allergens. Most common allergens that can cause allergic reactions include food, pollen, mold, dust mite, animal dander, insect stings, medications, and latex. Upon encountering these allergens, the immune system overreacts and produces an antibody IgE that travels to different tissues and plays a role in the release of substances such as histamine. The possible symptoms of an allergic reaction are numerous and may include: a runny nose, congestion, sneezing, itchy or watery eyes, breathing difficulty, wheezing, vomiting, diarrhea, swelling, hives and even loss of consciousness. In the most serious cases, a life-threatening reaction called anaphylaxis can occur. Genetic factors and environmental exposures play a role in why some people suffer. 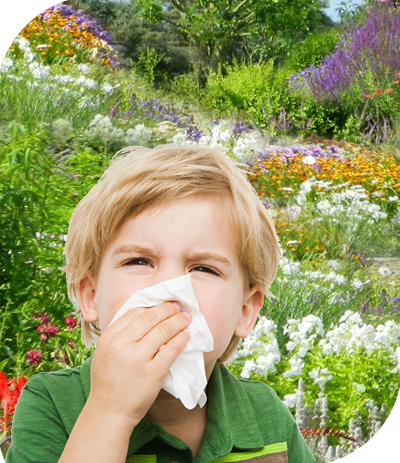 A holistic approach is needed to diagnose allergies. It includes a detailed history looking for clues in lifestyle and the environment, eating habits, family history, frequency and severity of symptoms and response to prior interventions. With proper treatment, many affected individuals can live healthy and productive lives. The Woodlands Allergy, Asthma & Immunology Center is dedicated to children and adults with asthma, allergies, and immunodeficiency. We strive to deliver the highest quality of care in a warm and caring environment. We excel in service by providing personalized, family-oriented care with state-of-the-art testing, treatment, and education.